During the summertime, when the general public usually is wasting away at the big summer tentpoles the studios put out (don’t worry, I’m as guilty of that as you are), I like to escape over to the local art house movie theater during the summer. There are always some really terrific independent films that come out during the summer, and some end up being films that are worth mentioning toward the end of the year, with Mud and Before Midnight as two prominent examples of such. 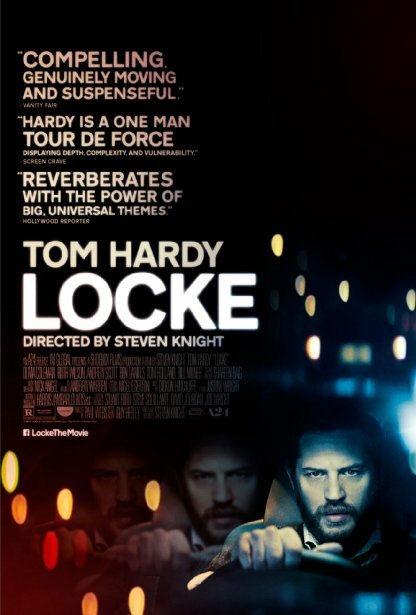 So the first of hopefully many independent films I hope to see later this summer is a small British film called Locke, which stars Tom Hardy and Tom Hardy alone. It’s a very interesting concept of a film that I’ve been hearing about for several months now. The film premiered to acclaim at film festivals in Venice and even at Sundance back in January. The film opened in the US back in April, but started to expand to other theaters in May, so this film will qualify as a summer film, which is a good thing, because this is a helluva film. Tom Hardy plays the titular character of Ivan Locke, a man who works in construction who must drive to London for the evening due to a personal emergency. During the time he’s driving, he takes care of some business he must attend to, one being with his profession and the other with his family. I won’t give away the specifics on what these plot points are, but they are something that drives Locke to a near breaking point, and that’s the entire film. Tom Hardy, driving in his car on a moody highway at night, making phone calls. It’s a terrific premise that could have gone horribly awry, and it’s done masterfully with this film. The film was written and directed by Steven Knight, whose best known credits are for writing the script for Eastern Promises and Dirty Pretty Things. He directed a film that very few people saw last year, which was a Jason Statham film called Redemption. The only thing I’ve seen by Knight was last years Closed Circuit, which was pretty lackluster to say the least. However, being this the second feature film he’s directed, it’s so meticulous and subtle in the way it’s made. Wright doesn’t do anything crazy with his camera or throw in any big action beats, as the film, for the most part, stays on Hardy the entire time. It occasionally shows the darkening abyss of the dark highway that Locke drives on, and how his life is slowly starting to deteriorate by driving in his vehicle. And who better to have in a role like this than a very competent actor like Tom Hardy, who returns after a brief hiatus after a crazy couple of years after his breakout role in Inception and as the villain of The Dark Knight Rises. The man is at the top of his game in this performance, but what makes this role unique is that Hardy plays it cool throughout. The man he plays isn’t necessarily James Bond, as he’s a family man who works in construction, but the events that unfold while he drives at night he takes very subtly. But there’s a bit of uneasiness when watching his character. What he could do feels unpredictable and sometimes a bit unsettling. Hardy is just memorizing to watch throughout this entire film, and it very well be the best performance of his career by far, and that says a lot after his terrific turns in films like the ones I mentioned, and the underrated 2011 film Warrior. The character of Ivan Locke is also a character, who we come to learn later on in the film, has screwed up a time or two in his life, and Hardy’s performance as this man who tries to make everything right in a matter of a few hours is truly exciting and thrilling to watch, but not in the way that you would think. This isn’t like the Fast and Furious films where there is action going on outside of the car, absolutely not. This is a slow burning thriller, and many folks will be turned off by it (I mean it, if people were whiny about Godzilla, then you know what I mean). So this film is not for everybody, but for the few that it may-be, Locke is a very special little cinematic gem of a film. It’s a damn shame that this film came out so early in the year, because this is truly one of, if not the best film of 2014 by far. It’s a near perfect film, and what’s great is that it felt like a breeze. The film is under 90 minutes in its running time, and not one minute did I even think about looking at my watch. The film was memorizing to watch from start to finish, and if the film is showing in your area, I highly recommend you go check out this film. It’s not a long film, and it’s not a time waster of a film. Steven Knight has made a truly unique and exciting film with Tom Hardy giving a performance that is the best performance of 2014 by far. I loved this movie, enough said. May 28, 2014 in 2014 Film Reviews, Movie Reviews.